"An educated individual is an empowered individual." HC+ Birth is an extension of the HC+ work toward relationship sustainability and community connectivity efforts. It is acknowledgment of the importance of birth and its influence on individuals’ relationships in their families, professions and in the community. Experiences that surround birth are often attached to our expectations for birth. Expanding expectations about what to expect during childbirth allows mothers and their support team to enter into the birthing environment with confidence and make adjustments as necessary throughout the process. We believe that a holistic approach to childbirth values the contributions of medical professionals and also reinforces the innate and intuitive strength and wisdom of indigenous knowledge systems. In this way, both the birth of the baby and the mother’s birthing experiences are honored and facilitate harmonious connections within the birthing environment for optimal outcomes for mother and baby. HC+ Birth focuses on engagement around birth topics and reactivating the skills beneficial to families during their childbearing years. In addition to acknowledging the intrinsic motivation toward becoming skilled, we also believe in apprenticeship in skill building as an important part of building a legacy for birth. These skills are necessary to equip the next generation to improve birth outcomes. We believe sustainability occurs through connectivity and community; and that experiences are enhanced when there are opportunities to connect with others in a culture of birth. Andrea and her first "batch of cookies" days before the birth of their little brother. 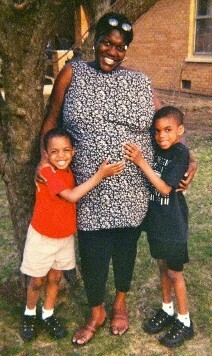 My mother Johnnie Mae Gray Little, who was also an educator, passed away a year before my oldest son was born. She had always told me that when I had my babies she would take a leave of absence from teaching to come where I was and "teach me." When I became pregnant with my sons, without knowing it, I began to look for my birth community. Without my mother, I looked for the people in my area that were to be my support, however, I did not find it where I lived. Instead, my sisters traveled to where I was to provide me support after my babies were born. My husband Eugene was also invaluable support (HE WAS A ROCK STAR) for me during my birth process and beyond. I never understood why all of my adult life I was so drawn to supporting women in birth. 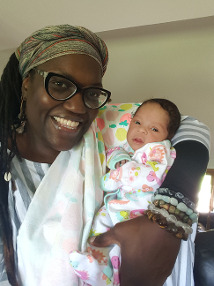 When I told my family about the commitment I had made to be a doula and birth ally, first I had to explain what a "doula" was. Initially, the response was a typical one, "Oh, so is it like a midwife…?" After I explained what the differences are, the older members of my family, who are from rural Alabama, began to explain how what doulas do was once what the women in the community did when they were growing up. My Aunt asked me if I remembered "Ms. So and So" who was a midwife and was also the one they called when people in the community were sick because she understood what herbs, roots, and teas helped which ailments during a time when hospitals were not accessible to people of color. My Dad, the oldest sibling of eight children, reminded me that all of them except one was born at home in the front room of the house I knew as my grandmother's--Big Momma's--house. He shared memories of his Dad (my Pa Pa) going to get the midwife "when it was time." He told me how the women in the neighborhood (grandmothers, mothers, etc.) would assist my grandmother and care for her during her pregnancy. Then how they helped her until it was time for her to give birth. He remembered these women taking long pieces of torn sheets and wrapping her stomach after she gave birth. He also said they cooked meals, cleaned for her and helped care for her children during the postpartum time. After those conversations, I began to reminisce on my childhood. I recalled the times when the older women would gather all of the teenage girls in a back room to talk to us about our bodies and explain what it meant to be entering womanhood. Even after my mother had passed away, older women encouraged me and my sisters to take care of one another. It was an expectation that we would care for one another during pregnancy, birth, and postpartum. Without ever having heard of the word "DOULA," we knew instinctively that the birth year was a year where a woman should have support. It was part of our tradition. In the absence of the community of women, I educated myself and learned to advocate for myself as a pregnant woman. Since that time, I have filled various roles as a wife, mother, educator, speaker, researcher, advocate, etc. ; still, my heart and passion towards supporting women during their birthing year has not waned. Assisting women during their birth year has always felt natural to me and a part of my DNA. Supporting women is a part of my legacy and I am always mindful to call upon the inner wisdom of the community of women who have traveled before me. They have laid out a powerful path for me to follow and I continually depend on my memories of them to point the way.